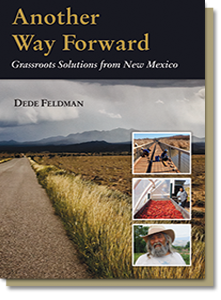 Another Way Forward: Grassroots Solutions from New Mexico is the latest book from award-winning author and former Senator Dede Feldman. Read about innovative organizations and inspiring local leaders who are changing the world in New Mexico, one neighborhood, one clinic, one classroom at a time. Order your signed copy today. After 16 years as a State Senator in the New Mexico Legislature, I’ve returned to restart my consulting business and share some of the lessons about working for change that I learned in public office. Being a legislator sharpens your skills as a speaker, advocate, campaigner, political strategy analyst, and communicator. Now I want to transfer some of those skills to you. My first book about New Mexico politics, Inside the New Mexico Senate: Boots, Suits and Citizens shares some of these tips and now I’ve written a second book, Another Way Forward: Grassroots Solutions from New Mexico about local projects that are lifting New Mexico from the bottom up. It highlights a set of related skills: collaboration, perseverance, asset building and social entrepreneurship. They are all ingredients of a new, more sustainable and just society. I’m available to help you or your organization with presentations, research and writing, strategic planning and training, and other political consulting. Contact me for more information about these services or catch up with me at one of my events. Before I entered the Senate I operated a small public relations business with clients ranging from political candidates and non-profits to hospitals and banks. Before that, I worked as a journalist and a high school and university teacher. I hope you—or your organization– can use my skills. My dream is to mentor a new group of values-based leaders in a variety of fields to make a difference in the decades to come. Please contact me at dedefeld@comcast.net for more information about my services or call 505-220-5958. Knowledge of a specific issue is not enough to affect change. Advocates need to know the process, how to present the right information at the right time, how to work with coalitions, appeal to opponents, activate grassroots support, satisfy foundation funders and get the media on their side. I’m here to help. 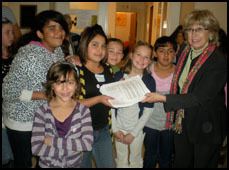 Alvarado elementary school students petition Senator Feldman to increase teacher salaries during a legislative session. Another Way Forward: Grassroots Solutions from New Mexico profiles innovative organizations and inspiring local leaders who are changing the world in New Mexico, one neighborhood, one clinic, one classroom at a time. Dede shows us what they have in common and how we can join in to make a difference from the bottom up. 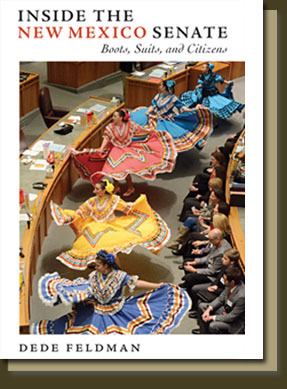 Inside the New Mexico Senate: Boots, Suits and Citizensis a legislative history with a human face. Here maverick leaders, shameless special interests, and earnest advocates clash in the unique arena that is the New Mexico Roundhouse. The New Mexico Senate comes alive, with stories of grit and grace, honor and disgrace. For students of government, advocates and lovers of politics this book is invaluable.